What does your family routine look like? Let’s take your mornings, for example. Can you and your children sit and eat together for a few minutes before heading off to school without a hiccup? Or is it a nightmare scenario where the house is in a state of chaos and you wonder how the heck you’re ever going to survive the next decade or so of motherhood? If you identify more with the latter, you’re going to love the Family Routines course. 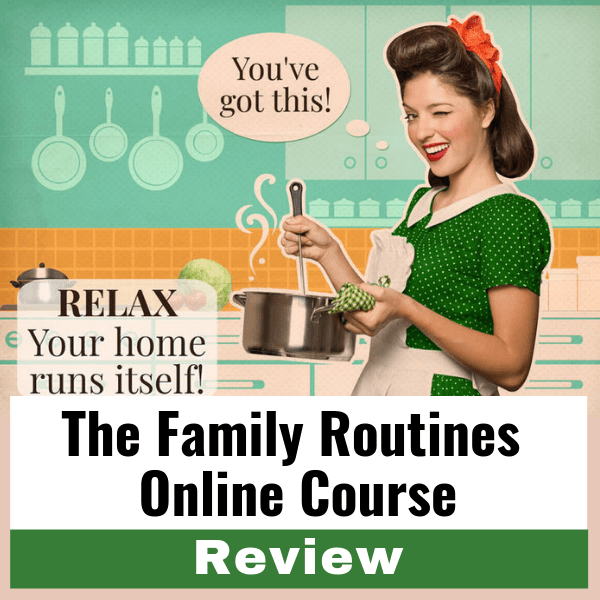 In this post, I’m reviewing the Family Routines online course by Pulling Curls. This is an unbiased review that discusses all aspects that you need to know before purchasing: what the Family Routines online course covers, what I liked and didn’t like about it, and whether its worth your money. Plus I snagged a discount code to help you out! This post may contain affiliate links. If you make a purchase from one of the links I will make a small commission at no charge to you. I received this course free of charge to review. ALL opinions are my own! What is the Family Routines Online Course? Let’s assume you’re completely new to any of the online courses by Pulling Curls. Hilary Erikson is the genius behind the blog. Her site offers practical and easy advice to help moms simplify their lives and reduce overwhelm. Hilary created two classes focusing on maintaining and creating order for your household: The Organized Home Course and the Family Routines Course. The Organized Home Course (which, by the way, I’ve also taken and loved) focuses on creating organization system throughout the home that basically take care of themselves. The Family Routines course applies that same concept to your family. Let’s focus on #3. Hilary’s advice works because she’s not just giving you new information that adds to your workload…once you implement her systems, they basically run on autopilot, making your life so much easier. For example, I am not exaggerating when I say that the home organization class revolutionized my house. My entire life, my shirt drawer has been a mess. I took her course about 8 months ago and it’s STILL organized. That’s the power of self-sustaining organization systems. Now, apply that concept to this Family Routines course. Imagine a household that runs automatically, without the chaos, the rushing, or the drama. That’s what the Family Routine online course is set to achieve. Do your kids refuse to do chores? Are you struggling to find a routine that works for you and your family? Is your house in a constant state of chaos? Are you overwhelmed by the everyday responsibilities weighing you down, like chores, packing lunches, getting your kids ready, etc.? You’re the prime candidate for this course. Hilary has a talent for creating order and organization. Her simple, easy-to-implement advice can simplify your situation and set up systems that allow you and your family to thrive. The Family Routines Course is not a parenting class. This course simply helps you automate your family’s daily routines. While it does have some great concepts that can certainly be applied to parenting, overall that’s not the intent of the class. If you’re a new mom and you’re looking for a sample of daily schedules, this isn’t that type of class. Having said that, I’d still recommend this class, but I also want you to have a clear idea of what it is before investing in it. The course contains an an overarching theme that makes it invaluable to new moms: parenting our children into adults. If you’ve read my blog at all, you know how I feel about creating independent sleepers. That concept of independence only grows more important the older they get. I don’t know about you, but I have the urge to coddle my daughter and do everything for her, because she’s my sweet baby. Creating an adult is the last thing on my mind right now. The lessons I learned in Family Routines completely changed my mindset about how I’m parenting my toddler. Every day, I strive to teach her the routines and skills she needs to grow and succeed as an adult. Because this course made me realize that the best routines start NOW, even at this age. So, yes, while this isn’t a baby schedule class, it absolutely can be of value to you! The Family Routines online course by Pulling Curls is a pretty equal mix of written material and video. The videos are short (about 10 minutes each), but very impactful. There’s no fluff. She realizes that her audience is busy and doesn’t have time to explore the theory of routines or case studies of children on routines versus those not… yada yada yada. The video portion of the course is filmed in her home. Personally, I enjoyed this production style because it added authenticity. Plus, online courses filmed by a professional crew in a studio setting are just about three times the price. The written guide is well-organized and easy to follow. It lists out the points from the video instruction while adding a few more essential tips. At the end of each lesson, there’s always homework. I highly recommend that you complete the homework because it will ensure that you apply these awesome tips. I completed the homework, created the spreadsheets, and had the discussions. I’m already starting to feel the difference. If you go with the monthly price, the cost is phenomenal. It’s’ just $10. You can’t even find a book on Amazon for $10 anymore, let alone a course. The annual price is $40. With the annual course, you’ll always have access to the improvements and any new content Hilary adds. As it so happens, Hilary gave me a discount code you can apply to both versions of the course. Just apply the discount code SAVE10 at the checkout. Family Routines Course Content: What I Loved, What I didn’t. I love Hilary’s overarching theme: we’re parenting ourselves out of a job. As you implement the advice you learn in this class, you’ll need to keep this in mind. If you don’t realize how important your job is, how important it is to get your kids to own up to these routines, you’ll just revert to chaos. The goal of the course is to train your kids to become self-sufficient adults. That means your kids pack their own lunches now. They have a set of chores that they do automatically, not because you’ve nagged them for the fiftieth time. They’ve packed their own bags for your annual vacation and if they didn’t…well, they’ll have to deal with natural consequences. Not only will this mentality create self-sufficient routines in your household, but it will help them throughout their adult life. Before taking this course, I thought I led a routine-filled life. I mean, an entire section of my blog is dedicated to routines for babies and young moms. I had no idea how chaotic my daily routine actually was! There have been so many times that I’ve felt overwhelmed by my endless list of chores. I’ve snapped at my husband because he doesn’t “do anything” when actually, I’m not delegating the tasks correctly. If you can relate, you’re going to love the chores section of the course. It helps you create a functional cleaning schedule (my very rudimentary schedule is above) and how to successfully get your kids (and husband) involved with that list. What if your kids haven’t done chores yet? No worries. Hilary walks you through how to introduce chores to your kids and get them excited about it. If I had one thing to gripe about with this course…it’s here in the chores section. I loved Hilary’s discussion on creating a cleaning schedule, which was why I was a little disappointed when I scrolled down to the end of the lecture and did not find Hilary’s sample cleaning schedule! Although I realize that there are several cleaning schedules on Pinterest, I would have loved to see hers and the to-do list she created on Tick Tick. Meals are always a chaotic time, even for families of three. It takes time to prep meals, time to cook them, and time to clean them up. When I saw that there was a lesson on tackling meal times, I gobbled it up (ha.ha.). The Family Routines online course goes over how to eliminate the chaos of meal times and how to include your kid in the entire process. The idea is for them to take ownership of their meal time responsibilities while teaching them to create their own meals in time. Eventually, your child will be able to pack his own lunches, help you prepare dinners, and become included with the grocery shopping process. If you think your kid is too young to help out with meals, you’d be wrong! After going through this section, I’ve made my toddler a part of our meal time prep (most of the time anyway). It’s going great so far! In addition to the above concepts, the Family Routines online course covers other pain points of your daily schedule, such as mornings, homework, and packing for vacations. She discusses how to get your kids involved in these routine systems and how to enforce their new responsibilities through natural consequences. While I loved her tips, I also really liked the organizational products she recommends. I think I went a little crazy during the packing segment of the class when she brought up using packing cubes…total game changer! One of the objections I see readers pose pretty frequently is this: can’t I just find all of this information on Google or Pinterest? However, finding that information takes time and a little bit of luck. Most of the techniques I learned in this course I would have NEVER thought to Google or search for on Pinterest. The Pulling Curls Family Routines Review Recap: Is it Right for You? So, the Family Routines online course won’t necessarily fix your life, but it’ll let you minimize some of the chaos that’s bogging you down. The course teaches what routines to establish, the mechanics behind setting them up, how to get your kids on board, and most importantly, WHY it’s so important to set up these family routines. Parenting isn’t just about survival. It’s about creating tiny, responsible future adults that succeed in life. If that sounds like something you want to be a part of then you really can’t go wrong with this course (plus she has a money-back guarantee!). I loved it and I think you will too. All in all, that concludes my Family Routines course review! If you’d like to purchase the Family Routines online course, click the button below. Don’t forget to use the SAVE10 coupon code! If your house needs some TLC and organization as well, don’t forget to check out my Home Organization course review. Total. Game Changer. P.S. If I missed anything or you have any questions about the course, let me know in the comments. I’m happy to help! In case you’ve never visited this blog before, I’m sort of obsessed with finding new and unique baby names. Celtic baby names are my absolute favorite. Especially unique Irish girl names. Not only do they possess a lyrical nuance, but most contain a personal meaning. And what mother doesn’t want her baby’s name to have an incredible meaning? During my first 7 weeks of motherhood I missed out on a tool that could’ve saved me hours of sleep. Even before I gave birth, I was obsessed with getting my baby to sleep through the night. You see, I can barely function with at least eight hours of sleep and two cups of coffee in my system. I knew that this whole infant wailing through the night thing wasn’t going to work for me.